Pretty much any year we have a reason to dress up for Halloween, Cyrus suggests a Sesame Street "Yip Yip" costume (video here for those who don't know what I'm talking about). And while it's a good idea, we've never made it happen. There usually isn't enough time and we come up with something quicker and easier to implement. But this year? He found instructions. It was still pretty much the last minute, but we managed to make it happen. We bought materials Friday night, and spent most of Saturday afternoon putting these together (one for him, and one for his little brother) for the party we were attending later than night. It was a team effort, with people taking turns with the measuring tape, checking the instructions online, me at the sewing machine, and a couple of us burning our fingers with the hot glue gun, but we did it! I think they turned out pretty awesome. They may have been the best costume at the party we went to (not that I have a biased opinion or anything). \n\n\nPretty much any year we have a reason to dress up for Halloween, Cyrus suggests a Sesame Street \"Yip Yip\" costume (video here for those who don't know what I'm talking about). And while it's a good idea, we've never made it happen. There usually isn't enough time and we come up with something quicker and easier to implement.\n\nBut this year? He found instructions. It was still pretty much the last minute, but we managed to make it happen. We bought materials Friday night, and spent most of Saturday afternoon putting these together (one for him, and one for his little brother) for the party we were attending later than night. It was a team effort, with people taking turns with the measuring tape, checking the instructions online, me at the sewing machine, and a couple of us burning our fingers with the hot glue gun, but we did it! I think they turned out pretty awesome. 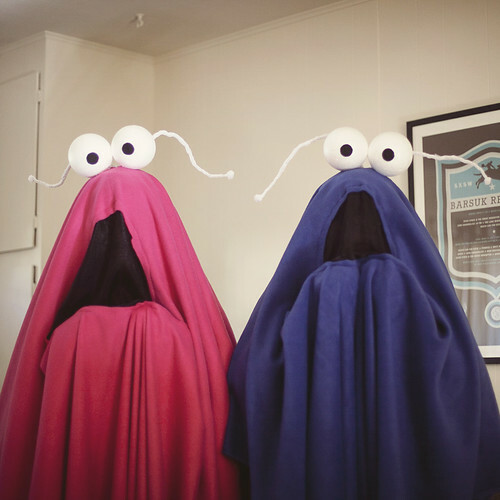 They may have been the best costume at the party we went to (not that I have a biased opinion or anything).\n\nYip, yip, yip, yip!